These multifaceted machines are used in the processing of linen and garments with water as the medium of wash. 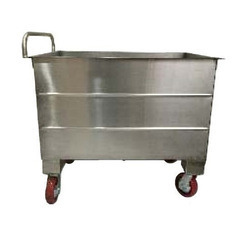 Both the outer drum and the inner basket are made of tested stainless steel of AISI Grade 304. The perforations in the inner basket are precision punched and embossed in a CNC machine. The gap between the inner basket and outer drum is very low thereby reducing the amount of water consumed per kg of load (liquor ratio). This reduces the amount of chemical and energy consumed. The inner basket consists of stainless steel beaters to provide a consistent lift to the garments. The electrical panel shows the time of the wash cycle (which can be altered) as well as the temperature. The machine has multiple safety features including a door limit switch,voltage filters etc. Heating of the wash load is via direct steam injection, stainless steel electrical heating elements or via gas heating. The drive of the inner basket is via a reduction pulley-belt mechanism. The pulleys are of strong cast iron and the belts are completely imported. The inner basket is supported by self aligning ball bearing for a noiseless operation. 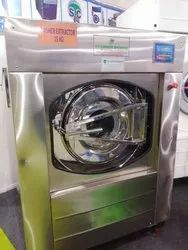 The chemicals enter the wash cycle in the inner basket via a stainless steel chemical box fitted on the side of the machine. The water inlet, drain and steam (optional) connections can optionally be converted to a complete automatic set up. There is a water level indicator fitted on the machine to correctly gauge the water allowed into the machine. 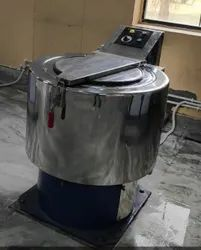 STC tumble driers use the principal of heat exchange to completely dry garments and other articles that have just been washed. The Complete stainless steel basket that holds the articles is precision punched in a CNC machine and is supported by self aligning ball bearing for a noiseless operation.The sizes of the perforations of the inner basket are optimally designed so as to ensure the right amount of airflow. The inner basket has stainless steel paddles also manufactured in a CNC machine to ensure consistency in the lifting of garments. The outer body is completely powder coated in our in house powder coating facility to ensure a long life. A programmable micro processor based control system comes standard with this machine. Settings than are displayed and can be programmed include cycle times, temperatures and residual humidity (optional). The heat exchange can be powered with steam,electricity or via gas. A reversing inner basket to prevent garments from tangling and a large door opening for ease of loading and unloading articles come standard. Emergency stop buttons and a safety limit switch is pre installed to ensure safety of the operator. The lint filter is extremely large and very easy to clean (low maintenance). The inner basket is doubly insulated with the finest quality mineral wool held in place by aluminum sheets on loaded spring hooked ties. The special radiator/heat exchanger design and efficient blower system makes the drying time of this dryer the best in its class. A cooling system for automatic cool down of the garments can optionally be provided. The inner basket and the outer drum are made of stainless steel and the inner basket is directly mounted on the drive motor. The motor is suspended with a coaxial setup along with thermal and anti humidity insulation. 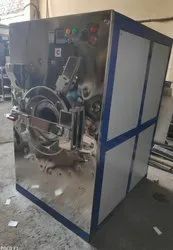 All the machines have the necessary door lock mechanism and continuous current braking system to assure a simple and safe operation. The design provides a quick, self-balancing noiseless and vibration less performance. The electrical panel shows the time of the wash cycle (which can be altered) as well as the temperature. The machine has multiple safety features including a door limit switch,voltage filters etc. Heating of the wash load is via direct steam injection, stainless steel electrical heating elements or via gas heating. Enables uniform acceleration of the motor. Prevents voltage fluctuation from affecting the motor. LCD display showing current drawn, frequency, output voltage etc. We have made a mark in this domain by proposing exceptional grade of Washroom Trolley. 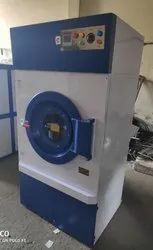 Our trolley is uniquely designed for laundries and developed optimum quality material and components, which is procured from reliable source of the industry. These products are energy efficient and non-corrosive in nature.